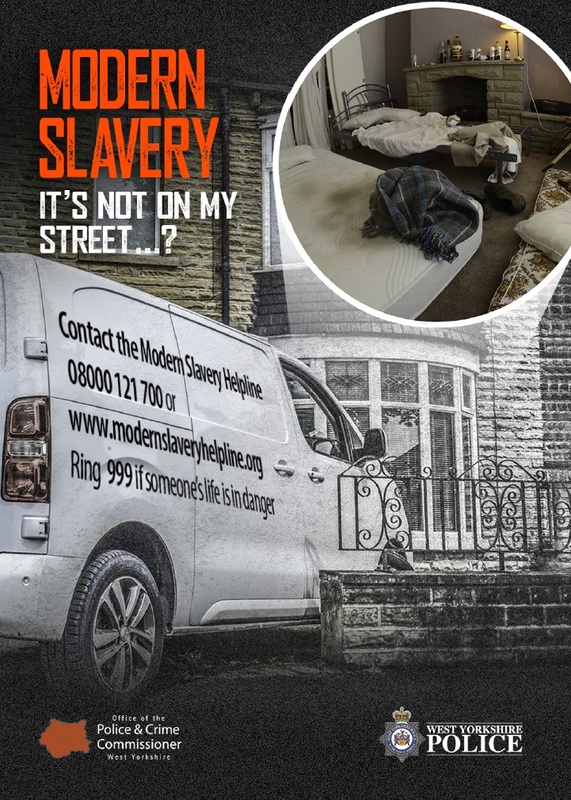 West Yorkshire Police and the Police and Crime Commissioner are urging residents to help prevent modern slavery – by watching out for it in their neighbourhood and workplace. The Force is urging people to know some of the possible signs of the crime – which trades in human misery – and to report any suspicions they have. It is a crime that is often ‘hidden in plain sight’ and it is thought that it is very under-reported. “Modern Day Slavery – or Human Trafficking as it is also known – is a vile and evil crime – and it could be happening on your street. It is a crime that knows no boundaries. “There are various signs to look out for – most of which are easy to spot – but what I am urging everyone to do is if they have any suspicions at all to get in touch. The best number to call is the Modern Slavery Helpline. Ring in confidence on 08000 121700 or visit www.modernslaveryhelpline.org. Or call police directly on 101. Is there a house on your street that isn’t quite right or in keeping with the others? Do the people living there seem isolated or secretive? Do more people appear to be living in the house than you would normally expect? Are the house windows covered from the inside? Have you ever noticed anyone taking an excessive amount of bed mattresses into the house? Have you been ignored if you’ve tried to make conversation or eye contact with anyone living in the house? Do the people that live there get collected / taken to work early in the morning and returned late at night? People can also be trafficked for domestic servitude. This is type of trafficking that again is usually well hidden. You might notice that of your neighbours there is one person in the household treated very differently – for example washing in the garden or always being accompanied when outside of the house and not engaging with strangers. “These are just some of the signs to look out for. Human Trafficking doesn’t just happen in houses though. “We are also urging people in the workplace to know who their colleagues are and again, report any suspicions they may have. Do you work with someone that gets dropped off and collected, possibly in a van, at the same time each day? Is their movement restricted or do they appear to be controlled? Have they suggested they don’t know much about their employment? Do they appear to be isolated or reluctant to talk about their circumstances. Do they look malnourished? Do they turn up in the same clothes each day? Do they appear not to have the correct equipment to do their job? Have they suggested they don’t have access to their wages? Or that they are getting paid an extremely low amount for the hours they are putting in or that their wages go into someone else’s bank account? If someone from authority has visited your workplace have you noticed that certain people hide during their visits? Do they appear fearful of such people or reluctant to make eye contact or talk to them? Do they show any signs of physical injury or psychological trauma, or suggested they have limited or no access to medical care. “It something we as a Force take extremely seriously and we were one of the first to have a unit set up specifically to deal with this crime. “Our communities are one of our best tools in the fight against human traffickers. We really need their support to report any suspicions, no matter how small, which is why this new campaign has been launched. “It’s a common misconception that people who have been trafficked can just walk away. Victims often don’t speak English, they have their money and documents taken away from them, and if they even think about leaving they face very real threats of violence against themselves and even more disturbing, their families back home. As part of the campaign the Force has designed some indicator cards which reinforce the message about what to look out for. It is being further supported with social media messages on the Force’s main facebook (facebook.com/westyorkshirepolice) and twitter @WestYorksPoliceaccounts.